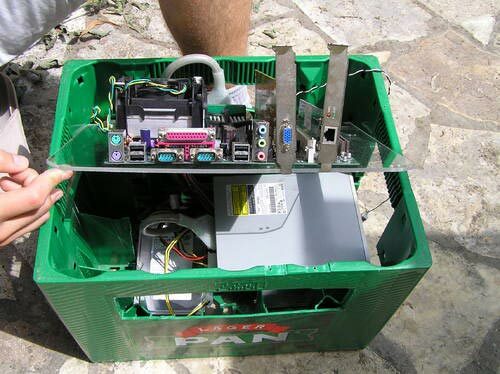 Here’s a fun and unusual PC case mod, using a beer crate. Moder Mortal form Techpowerup forums decided to use his laptop for the mod, the specs include a P4 wilamette, 4x128mb RIMM, s3 32Mb, seagate 40gb and a combo drive. 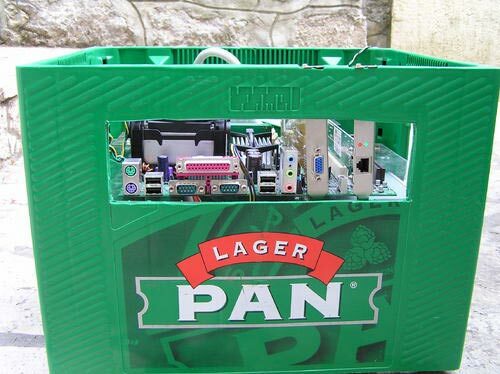 As you can see i’ve took beer case and made my laptop from it :)I’ve designed it into two levels on first is PSU screwed into bottm asvell HDD. Rom is mounted to top of psu. Then on second level is MBO with all acessories. MBO is screwed into plexiglas so it can move it with it. This is a great fun mod, it is amazing some of the things people will make a PC out of.